CASTLEMAINE’S historic old Theatre Royale was the setting this weekend for the first Victorian performance outside their native Cuba of the island nation’s outstanding traditional band. As one of the showpiece attractions at the 40th anniversary of the biennial Castlemaine State Festival El Son Entero (or The Full Sound) packed the venue. As the salsas, cha chas, trovas, mambos and boleros and much more filled the theatre, festival goers – including your scribe and his wife – got up and danced in the aisles. It was an exhilarating evening and a feather in the cap for festival director Martin Paten. He’d travelled to Havana to engage the eight-piece band for a truly amazing 90-minute performance. Accompanying El Son Entero was a documentary film encapsulating rare, archival footage of the history of Cuba’s music, dance and film. So we heard and saw how Cuban musical styles had evolved from the Spanish colonial era, through African slavery on the plantations to their current position as hugely popular global music phenomena. Working hard at the front of the orchestra were singers Jorge Isidoro Luaces Delgado and Daulim William Aldana Boudet. When one took over the vocals, the other grabbed the maracas. Perhaps the hardest worker on the night was trumpet player Randy Emmanuel Veitia Godinez. He also had brief spells on the percussion instruments when lead guitarist Michel Hernandez Torres held centre stage. It was fascinating to hear via the documentary that trumpets only became part of Cuban bands later in the evolutionary process. As an ecstatic audience resumed their seats after their final bracket, out came El Son Entero again for their encore. 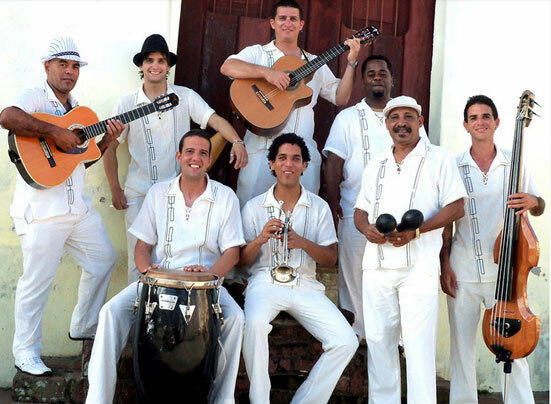 And, of course, it was the legendary Chan Chan – the signature number of the famous Buena Vista Social Club. Inspired by slide guitarist Ry Cooder, director Wim Wenders helmed the 1999 documentary of the same name – Buena Vista Social Club – where the duo brought together an ensemble of legendary Cuban musicians to perform in Holland and at New York City’s Carnegie Hall. And the reason why El Son Entero agreed to a central Victorian performance? Since 2011 the Castlemaine community has been involved in an aid programme with Cuba sending fine timbers, strings and luthier tools to instrument makers in the Carnaguey Province. The Castlemaine State Festival committee has been working directly with the Cuban Ministry of Culture in these inter-nation mentoring programmes. El Son Entero has dates in Tasmania and Fremantle coming up in April. What’s the betting The Song List Rat lists some of his/her favourite riffs from the Cuban band anytime soon following their early April performances at the Fremantle Street Arts Festival? This entry was posted in Music and tagged Castlemaine State Festival, Castlemaine State Festival El Son Entero, El Son Entero, Fremantle Street Arts Festival, Richard Jones, Theatre Royale Castlemaine. Bookmark the permalink.